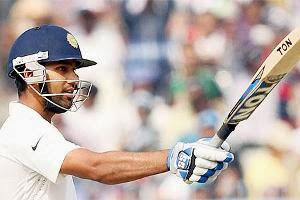 1) Ind vs WI Test- Day 2: Rohit Sharma hits century on debut to put India in command- Rohit Sharma became the 14th Indian to hit a century on Test debut as India recovered from a top-order collapse to take a firm grip of the first Test against the West Indies with a 120-run first-innings lead on Thursday. Sharma stole the thunder with his unbeaten 127 as the hosts, who were precariously placed at 83 for five at one stage, reached a comfortable 354 for six at close on an eventful second day's play. 2) ISRO performs first orbit-raising operation on Mars mission-Indian Space Research Organisation today performed the first orbit-raising manoeuvre of the Mars Orbiter spacecraft, which was launched on Tuesday. “We started it by 1.17 a.m. and have successfully completed the first orbit-raising manoeuvre of Mars Orbiter Spacecraft. Right now, the computation is going on,” an ISRO spokesman told PTI. 3) International film festival to be held in Goa this month: Minister for Information and Broadcasting Manish Tewari has announced the launch of the 44th International Film Festival of India to he held in Goa later this month. The film festival is set to take off on November 20 and will end on 30th of this month. 4) 1 killed, 6 injured in Manipur bomb blasts: A labourer was killed and six others were injured when suspected militants exploded two bombs in Thoubal district of Manipur. 5) 3 Indians bag youth business awards: Indian entrepreneurs have bagged three out of five international awards given by The Prince’s Youth Business International (YBI) for 2013. Forty countries in the YBI network compete for these annual awards. The winners were felicitated by the Prince of Wales in St. James Palace. The winner of the Young Entrepreneur of the Year award was Sharad Tandale, while Godavari Satpute bagged the prize for the Women Entrepreneur of the Year. Mentor of The year award was won by Mohan Singh, while Vikram Deshmukh was highly commended by the Judging Panel for the Environmental Entrepreneur of the year award. 6) Russia launched Olympic torch into space: Russia launched the Olympic torch into space on Thursday, as part of the flame’s journey ahead of the Sochi Winter Olympics. 7) US-Indian Navy joint exercise begins: Four-day joint Naval exercise ’MALABAR 2013’ in the Bay of Bengal between the US and India, providing an opportunity to advance multi-national maritime relationship and mutual security issues, began today. 8) Uninor CEO Yogesh Malik quits: GSM operator Uninor’s, the Indian unit of Norway’s Telenor, Chief Executive Officer Yogesh Malik has resigned, citing personal reasons. 9) Google’s doodle celebrated 125th birthday of Nobel laureate C.V Raman: Today's doodle celebrated the 125th birth anniversary of the scientist with an illustration of the Raman Effect. While Raman’s face is featured behind Google’s G, the two Os that follow demonstrate the Raman Effect, a discovery that saw him win a Nobel Prize in 1930. 10) India home to 103 billionaires; 6th largest globally. India has more number of billionaires than France, Saudi Arabia, Switzerland and Hong Kong and is home to the sixth largest group of super rich population in the world, says a report. Moreover, the country's financial capital Mumbai with 30 billionaire, is among the top 5 'billionaire cities' globally, which was topped by New York that is home to 96 billionaires. 11) Central Election Commission (CEC) of Tajikistan on 6 November 2013 declared that Imomali Rakhmon was re-elected as the President of Tajikistan. Imomali Rakhmon belongs to People's Democratic Party of Tajikistan (PDPT). The President of Tajikistan is elected by popular vote. The term of the office is 7 years. 12) The Minister of Railways Mallikarjun Kharge flagged off the first ever Dual Cab 4500 HP Freight Diesel locomotive called Vijay from Diesel Locomotive Works (DLW), Varanasi, a production unit of Indian Railways, on 6 November 2013. 13) Airtel launched 3G services in Bangladesh: Airtel Bangladesh, a unit of Bharti Airtel, has launched 3G services in Bangladesh’s Dhaka and Chittagong cities.